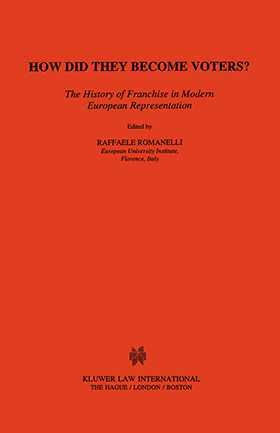 This book represents the results of a collaborative research project on the history of the franchise organized by Raffaele Romanelli at the European University Institute in Florence. Its object of investigation is the basic mechanism regulating electoral processes in many countries, both in Europe and in America, from the beginning of the 19th--when the modern concept of political representation was first shaped-- to the 20th century, when a large number of democratic countries shared some basic tenets of a universalistic electoral system. In bringing together historians and political scientists of different nationalities and cultural backgrounds, this book offers an extended, comparative and interdisciplinary view of the construction of the electorate, viewed as a process of institutional engineering. It examines electoral laws, together with the processes of their implementation through administrative procedures, rituals, and social practices. As Romanelli points out in his introductory chapter, the various systems which follow each other in the history of a single nation and are exported or imported in different countries, adapt to various traditions and contexts. They comprise a group of varied cases, too complex to be ordered on a single scale ranging from a more restricted elitist representation to a universal equal suffrage of modern democracy. Rather, this study offers new insights into the relationship between electoral systems and social structures, and lead the reader to reflect upon the many contradictions and crises suffered by representative democracy in current times.